I bought this souvenir while on a church youth group trip from York Beach, Maine to Pennsylvania. We toured from mining country in the western part of the state, to the minister’s family home in Lancaster County (his parents’ house nestled among Amish farms), to Philadelphia. There we toured the University of Pennsylvania’s museum, saw Independence Hall (with the Liberty Bell on display in the hallway), and toured the new Philadelphia Mint. I bought this coin/medal, encased in its snazzy plastic display stand with faux bois detailing. The first mint was built in Philadelphia in 1792. 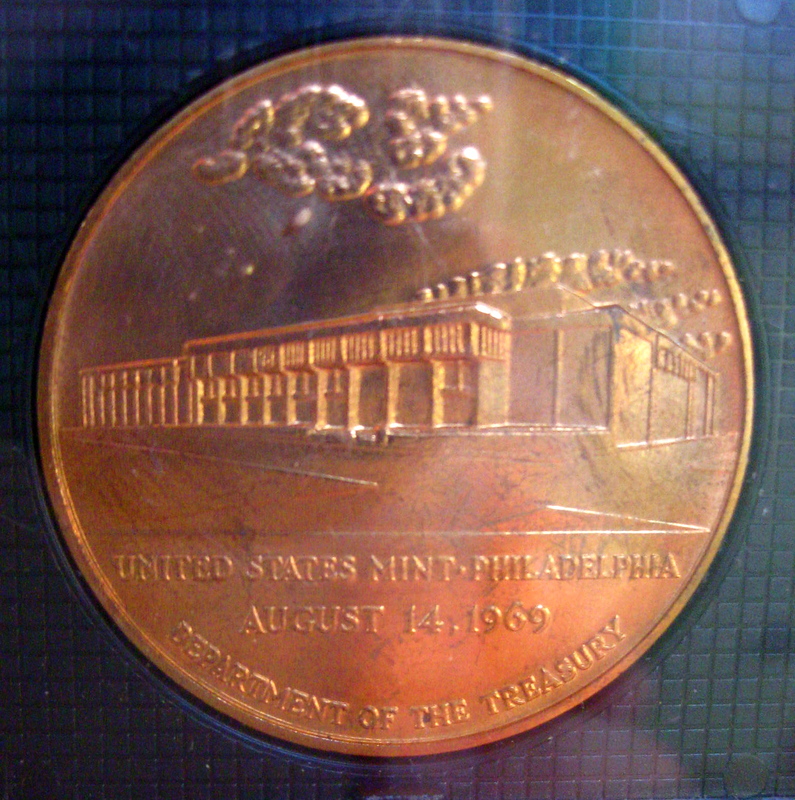 The building pictured on this coin was the fourth Philadelphia mint, opened on August 14, 1969 and designed by architect Vincent G. Kling. It was the largest mint in the world until 2009, covering a full block, from North 4th to North 5th Streets, from Race to Arch Streets. You can still tour the building today, though I’ll bet you can’t get a nifty souvenir coin like this one anymore! Vincent Kling, who would head the largest architectural practice in the Philadelphia region in the 1960s and 1970s and shape much of downtown Philadelphia in the post-World War II era, was born and raised in East Orange, NJ. The son of a builder, Kling worked for his father’s construction firm in the summer during high school. He began his architectural training at Columbia University and earned his tuition through a variety of jobs during the lean years of the Depression when his father had little work. Kling was an outstanding student at Columbia, winning numerous prizes and completing a B.Arch. in 1940. This degree was followed by an M.Arch. from M.I.T. in 1941. Kling enlisted in the U.S. Navy after the attack at Pearl Harbor, and served as a pilot in the Atlantic fleet naval air force until the close of the war. Flying has remained one of Kling’s life-long interests: he was a licensed commercial pilot into the 1980s. After the war, Kling returned to New York, where he entered the office of Skidmore, Owings & Merrill as a designer. The corporate organization of the growing firm undoubtedly served as the model for the practice Kling would later build in Philadelphia. He left Skidmore, Owings & Merrill in 1946 to establish his own office. As SOM also did, Kling grew his firm into a group of studios, each headed by an architect supervising a team of designers and draftsmen. In the 1970s, this process was further refined by the corporate subdividing of the firm into architecture and related specialties (including engineering and landscape design). This highly organized and efficient system was a key element in the successful completion of a prodigious number of projects, many on a large scale, in the Philadelphia region and beyond. One of the earliest of these was the creation of Penn Center in Philadelphia in the 1950s, for which Kling was the principal architect and planner. By the late 1960s, Kling’s firm had become the largest in Philadelphia, and by 1973, Kling was at the head of the largest architectural practice in Pennsylvania, with an office of nearly 400 employees. Kling became a member of the national AIA in 1948, and was named a fellow in 1960. He served on many AIA committees between the 1960s and 1980s. Kling was a director of the Philadelphia Chapter between 1959 and 1961, and its president in 1965. The projects accomplished under his direction have been recognized many times by the profession: he received national AIA honor awards in 1954, 1966, 1967, and 1969; the Philadelphia Chapter bestowed 11 awards on the work of the office between 1949 and 1980. In addition to these honors, he was awarded the Samuel F. B. Morse Medal by the National Academy of Design in 1968 and 1972. He served on the Philadelphia Art Commission between 1968 and 1972, and was a trustee of Columbia University in 1965-1971, among other involvements. Kling retired from practice in 1987.